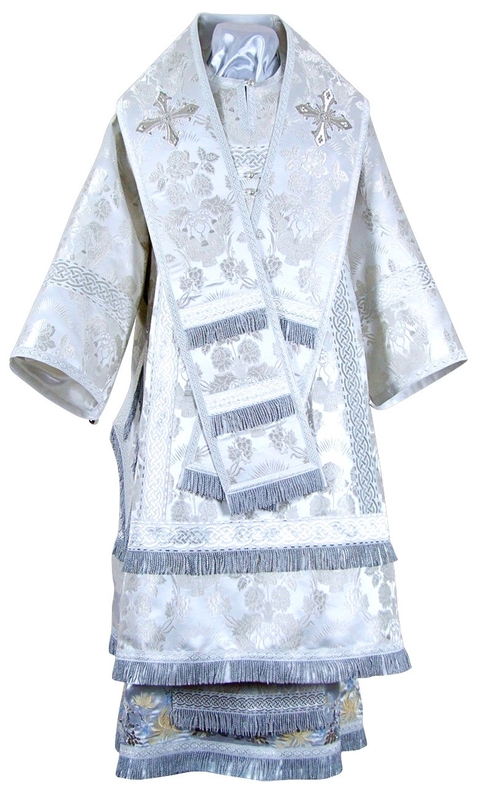 Orthodox Church liturgical Bishop clergy vestments (white-silver) by Istok Church Supplies Corp.
A Bishop is a high ranking official entrusted with a special function in the Orthodox Christian order of clergy. The dignitary who occupies this post is outfitted with special distinctive vestments that befit his position and set him apart from others. Istok Church Supplies offers finest quality Bishop Vestments in white and silver to help Bishops carry out their ecclesiastical duties in style and comfort. The color of a liturgical garment is symbolic and reflective of the mood within a church. 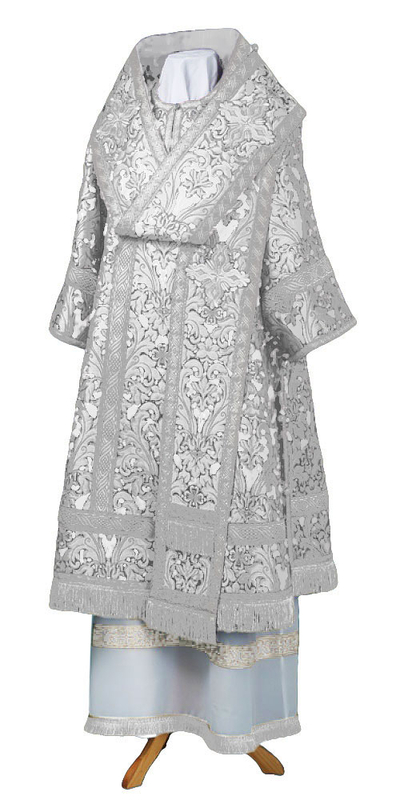 Our handsome Bishop vestments in white and silver are ideally suited for various liturgical services including feasts and post feasts related to important events like Pascha, and Lord’s feasts like Epiphany and Transfiguration. We offer this collection of vestments in three excellent material choices – rayon jacquard brocade, metallic jacquard brocade and natural German velvet. No matter which product you choose, you can be assured that it has been created with the highest attention to detail and in keeping with time honored traditions of the Orthodox Christian faith. We offer plenty of options for customization so that customers can purchase Bishop Vestments that reflect their aesthetic sensibilities, church requirements and budget. 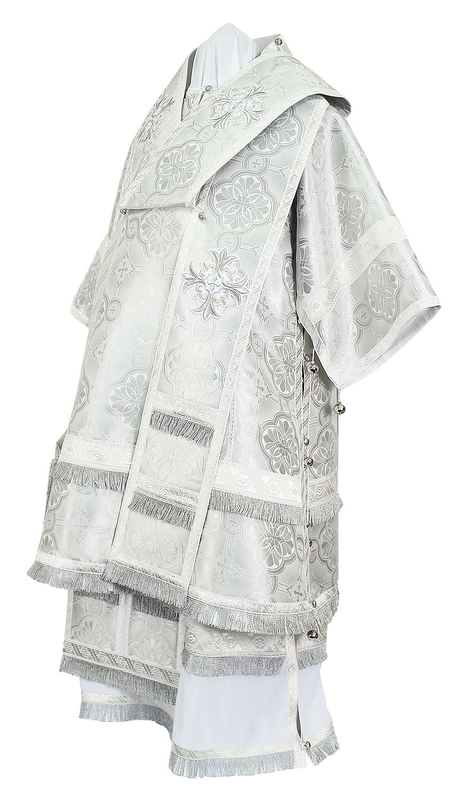 Our Bishop vestments in white and silver are available in three styles – standard, premium and luxury. To increase comfort, we provide natural rayon lining and natural velvet inserts. We offer complete sets of Bishop Vestments that include eight individual items – sakkos, belt, epigonation, epitralhilion, cuffs, small omophorion, large omophorion and sulok. Customers can order for matching chalice covers and stikharion for these sets at an additional price. You can also select from beautiful embroidered icons that can be stitched on the backs of these vestments. To look and feel your best while carrying out important responsibilities and services, you need vestments with the perfect fit. We invite customers to provide us their individual measurements as per our measurement chart so that our experienced master tailors in Europe can create best fitting Bishop Vestments. It takes a few weeks to stitch bespoke vestments, so place your orders as soon as possible to receive them at the earliest!